Many of us grew up wanting to conquer the world. We didn’t want partners; we just needed challenges. There’s a point where you realize that true success is when the team achieves success and everyone gets what they want. 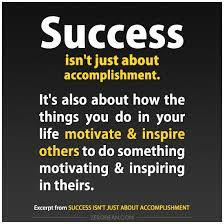 Unfortunately, there are many who don’t want to share success, they want it all for themselves. As a “mostly” only child, my sister was six years younger than me. I always felt I was the star. My parents doted on me and everything I did was wonderful. My one good quality as a kid was that I shared my toys until my sister came along. Many of us are “self-starters’ or entrepreneurs. The good news is we “can do it by ourselves,” the bad news is we only want to do it alone. The key is to recognize that it’s a lot easier and quicker if we join forces with others. We also have the opportunity to learn from others and improve our “vision” of the world. How do we make it happen? First, we have to realize that every employee brings different skills and attitudes. It doesn’t mean everyone is great, but together they can shine and produce something awesome. It’s like being the team captain and loving the results. If you’re the team captain, forget about all those well-rounded employees. It’s doubtful that you have them. Instead look at everyone’s strong points and figure out how to use each of their skills. Maybe some people have considerable interpersonal skills and get along with everyone. Some people have great attitudes. Support those with the skills and help them get better. Make sure you find something that works for each of them. Know your goals and what you’re trying to achieve. Give each person a spot and help them succeed. Some people need more support and praise then others—give it to them. Maybe its attitude, or interpersonal skills, or teamwork, or a specific skill set… whatever it is, that attribute is the foundation for individual employees and for your team. Training can fill in the gaps, but this is the attribute almost every employee must possess. Look at your puzzle. Can you take weaker people and help them achieve and shine? Long term it’s a lot less work if you can get others to do it for you. Once they have their maiden voyage, they will get better. I worked with a group that decided to create a cookbook for their customers. The first year it was so much work that several times the leader wanted to tell all of them to leave it alone, and she would do it. The next year it was like “a walk through the park” as they say. Everyone knew who they could depend on and what each person was capable of doing. Now they’re working on the third year and they are getting incredibly creative. Everyone learned from this event, especially the manager who was able to continue her work while everyone found their place. For some interesting ways to motivate your employees, check out how to motivate employees. All of these quotes speak of a greater good that comes of not trying to carry the load by yourself but by the power that only comes from efforts of the entire team. A cousin of mine that runs a multi-national company once said “You have to be smart enough to surround yourself with good people.” When leaders strive to do this and gain the added strength of these good people working as a team, all things are possible. “All for one and one for all!” Indeed! Always good to read the words of people I have learned from and respect like yourself and Chris Ramey.